How far did Ed Miliband go in renewing social democracy at a critical point in political history. What went wrong for Ed Miliband. Is Ed Miliband to blame? Is Jeremy Corbyn here to last? Was Miliband successful at turning the page on New Labour and at re-imagining social democracy for the post-global financial crisis era? This study maps the ideas – old and new – that were debated and adopted by the Labour Party under Miliband and shows how they were transformed into policy proposals and adapted to contemporary circumstances. 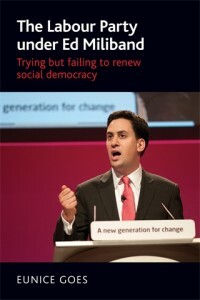 It seeks to demonstrate that the Labour Party under Miliband tried but failed to renew social democracy. This failure is one of the several reasons why ‘Milibandism’ was so overwhelmingly rejected by voters at the 2015 general election.Goes offers a thought-provoking perspective on how political parties develop their thinking and political blueprints that will appeal to scholars and students of British politics and ideologies and to anyone interested in contemporary debates about social democracy.